I was day dreaming about what kind of real hot rod I would build for myself if I had an unlimited budget. My tastes have always run towards muscle cars but I've been autocrossing my real cars and running open track days for many years now and I've really come to appreciate the fun you can have driving in these types of events. The old muscle cars can't really hold a candle to the modern machines in these events. I've also got a weird affection for those forlorn '70's cars that most people have forgotten about. While dreaming about my next project a while back I started thinking it might be neat to blend these genres together and build my idea for unique track day car that would grab lots of attention on cruise night as well as dominate an autocross course. For my dream Pro-Touring machine I dug through my plastic bone yard and found a used MPC 1977 Plymouth Volare body that I had picked up at a swap meet for cheap some 20 odd years ago. I think I paid like three bucks for it because all I got was the body. It didn't come with a chassis or interior. For the past couple of decades I patiently hoped to stumble across a chassis and interior for it so I could do something with it, but it never happened. Several times in the '90's this body almost got a pro-street chassis, then a few years ago I started thinking about hogging out the wheel wheels and making a '70's style short track race car out of it. Then the idea came to me to make a modern track day & autocross car out of it so I started looking for a chassis for it. This idea had the benefit of not needing a stock interior for it. After test fitting a bunch of different options, I found the old MPC generic stock chassis and roll cage from a Buick Regal stock car was a decent fit and I decided to use it. The chassis just took some minor trimming for it to fit the Plymouth Volare body. 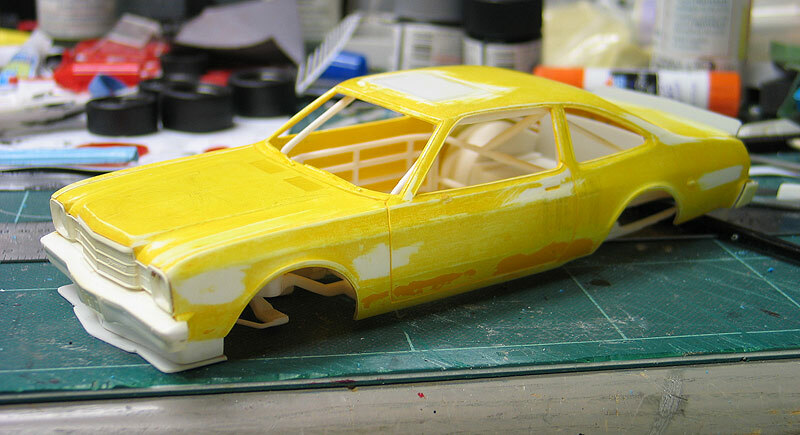 The Plymouth Volare body was soaked in a vat of Castrol Super Clean to strip it's old yellow paint job. The old chrome was stripped too. The previous builder had cut a large hole in the roof for a sunroof, so I filled that with sheet plastic and bondo. I also removed all the body emblems, door handles and side marker lights for a custom look. Since this was going to be a track car, I decided it would need some aerodynamic help. The NASCAR style rear spoiler was sourced from the same MPC Buick Regal kit. With some minor reshaping it fit the contours of the Volare pretty well. On the front end I wanted the old Plymouth to have a more modern look. I scratch-built the front air-dam and splitter from sheet styrene and then covered it with carbon fiber decals. The adjustment rods were made from guitar string. 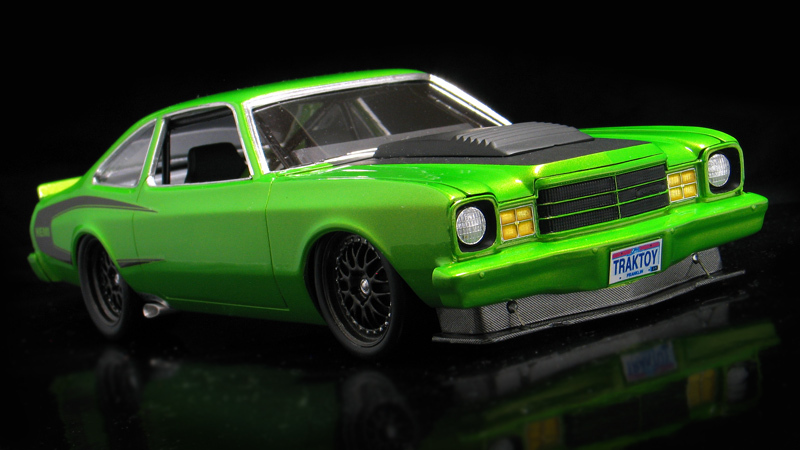 The louvered hood scoop was made from the custom hood from an old Revell IMSA bodied Chevy Monza kit. My kit was missing the tail lights too. Luckily, I dug around in my parts box and found that the lens from an AMT '78 Pinto was a drop in fit. I mounted them backwards for a neat custom look. No pro-touring car would be complete without a set of big rolling stock. 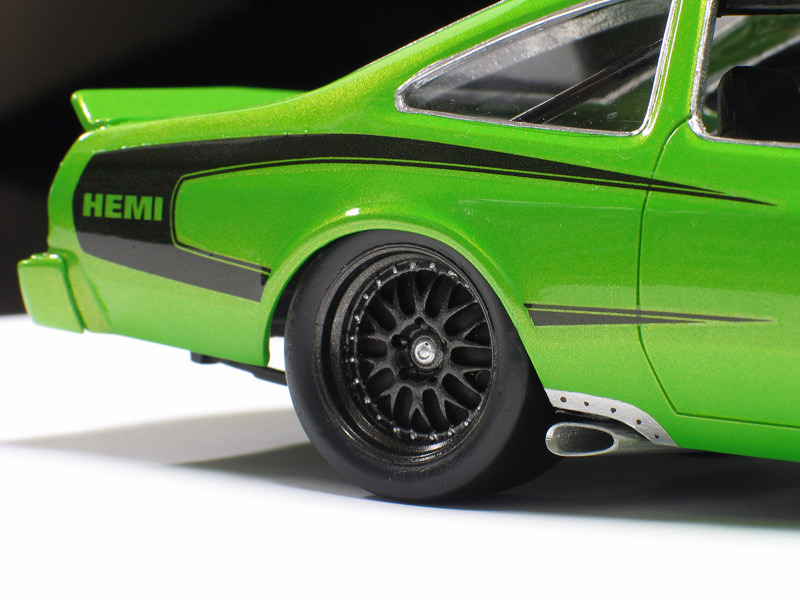 For this car I chose a set of wide and wider 19" BBS road racing wheels and tires sourced from a Tamiya Porsche 911 GT2 kit. The wheels were painted a custom mix of metallic flat black. 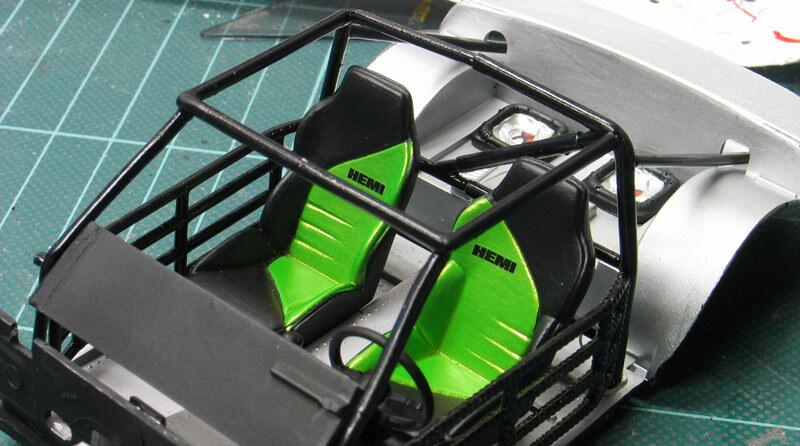 The interior is a mix of the MPC stock car dash board with Revell '95 Corvette ZR-1 seats and an '85 Mustang GT Steering wheel and shifter. Other details include speakers and amps which I resin cast from a Jada Toys die cast car. 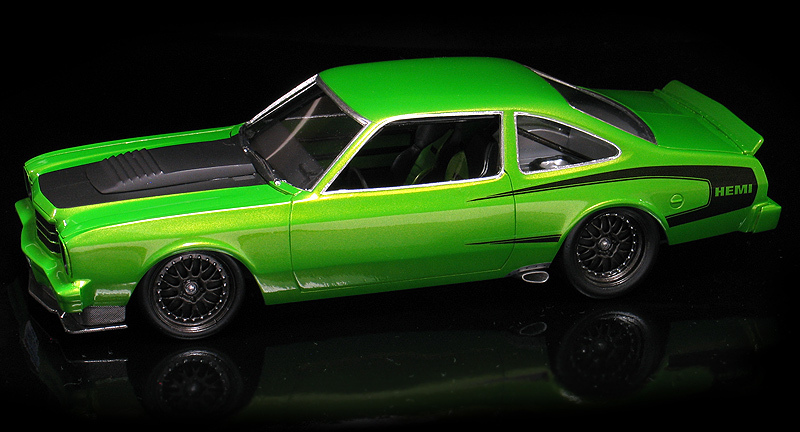 For the visuals I wanted this Mopar to evoke the spirit of classic '60's Mopar muscle. 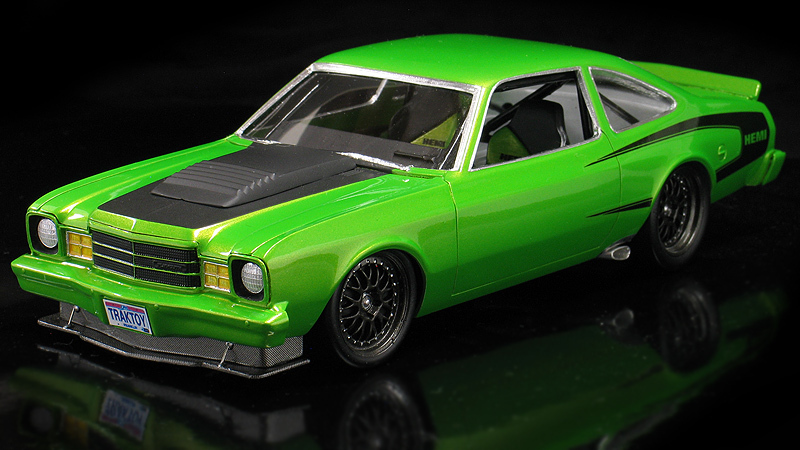 For paint I chose Tamiya candy lime green which to me is sort of a modern interpretation of Plymouth "SubLime" green. I then designed my own custom graphics on my computer and printed my own custom decals with an inkjet printer. The graphics are inspired by the "C" stripes from the '70 Dodge Super Bee. 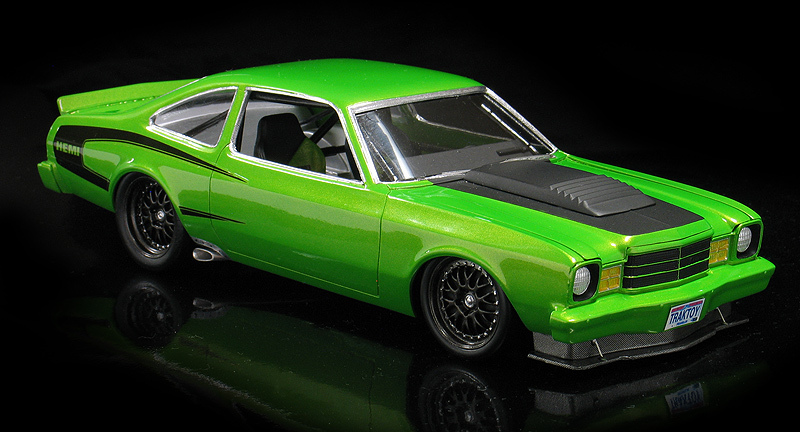 After the paint and decals, the whole body was shot with PPG Concept 2000 urethane clear. Lastly the hood and trunk filler panel were masked and sprayed flat black to complete the look. The final details I added were side exhaust tips made from aluminum tube exiting through a notch in the body. The license plates were my own design too. 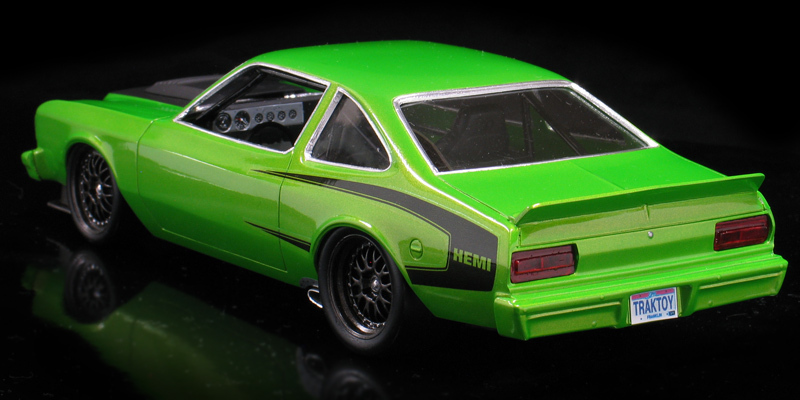 Although my model is just a curbside model with no engine and the hood glued shut, I'm envisioning a modern 6.1 SRT Hemi motor under the hood would be perfect choose for track use, especially with an aftermarket supercharger. 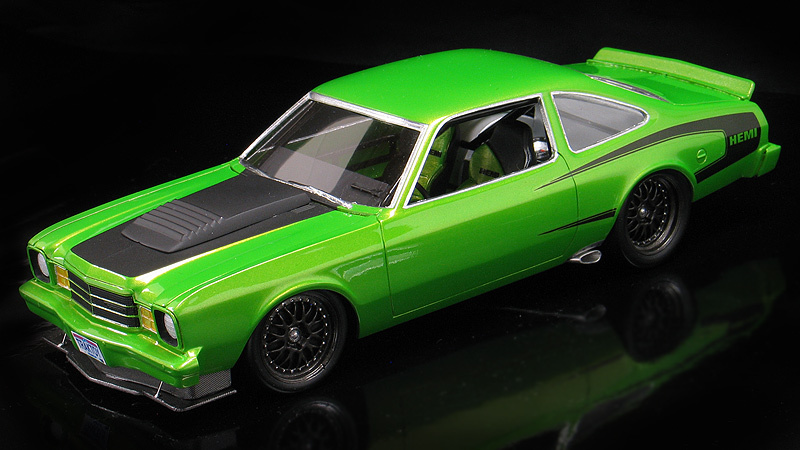 A real Plymouth done up just like this Volare would be the hot ticket for carving through the cones on an autocross course and chasing down Corvettes on open track days. A track toy needs a hauler to tow it to the track so here's a glimpse at the matching truck I built to go with it.